- ActiveGuard® Mattress Liners appear to have great potential in killing bed bugs that come into contact with the liner when installed on mattresses or box springs in a standalone preventative situation. ActiveGuard® continues to be efficacious after approximately 2 years of constant hotel use. - A demonstration of a cost effective, efficacious bed bug remediation program studied over one year including ActiveGuard® Mattress Liners for long-term control. - Initial field trials indicate that the installation of ActiveGuard® Mattress Liners on mattresses and/or box springs that have been largely cleared of bed bugs is a viable use of the product as a component step within a bed bug control program. 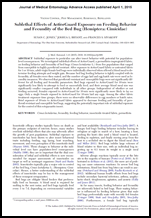 - Given the ubiquitous nature of this insidious pest that thrives in transient environments, can a cost-effective and sustainable prevention program be implemented, consistent with the best practices of integrated pest management? Let’s see what four (4) experts have to say! 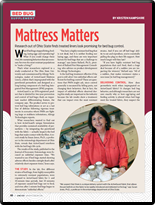 - M&M Environmental demonstrates the effectiveness of ActiveGuard® Mattress Liners for senior living facilities against the threat of bed bug reinfestation. - Field Data evidencing ActiveGuard®'s ability to prevent bed bug infestations in a large assisted living facility. 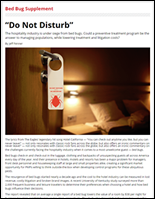 - While there remains no evidence that bed bugs convey disease at the present time, the ramifications of bed bug bites remain widespread. - ActiveGuard® - a permethrin-treated fabric, provides a surface from which bed bugs begin rapidly to absorb permethrin on contact and within the ﬁrst 1 cm of travel. Within 10 minutes of contact (or 4 cm of travel), approximately 42 ng is absorbed per insect. 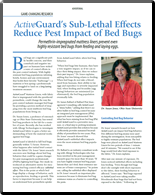 -Laboratories studies investigate the sublethal effects of ActiveGuard® Mattress Liners on feeding behavior and fecundity (fertility) of bed bugs. 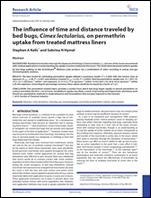 The study indicated that even brief exposure of 10 min to ActiveGuard fabric appeared to decrease feeding and fecundity of pyrethroid-resistant and susceptible bed bugs, suggesting the potentially important role of sublethal exposure for the control of this ectoparasitic insect. 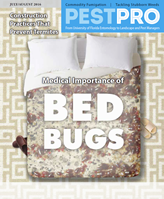 Permethrin-impregnated mattress liners prevent even highly resistant bed bugs from feeding and laying eggs. Research out of Ohio State finds treated liners look promising for bed bug control. - A comprehensive review of the genesis of insecticide-impregnated fabrics with segments on: the modern use of long-lasting insecticide bed nets for bed bug control; understanding resistance in bed bug populations; and, what happens when bed bugs are exposed to active liners? - Laboratory studies indicated that ActiveGuard® adversely affected bed bugs from diverse populations and degrees of resistance. The fabric was deemed to be non-repellent to bed bugs from five tested populations. Furthermore, with a limited thirty minute exposure to ActiveGuard®, bed bugs from every strain studied demonstrated an impairment in their ability to feed to repletion. - A global review of current bed bug control strategies with commentary on areas of improvement including emerging new technologies and the need for cost-effectiveness. - According to the following research, a new mattress liner can be used as part of a comprehensive program to help control bed bug infestations.